In Italian with English subtitles. The title translates to The Monsters. Widescreen. 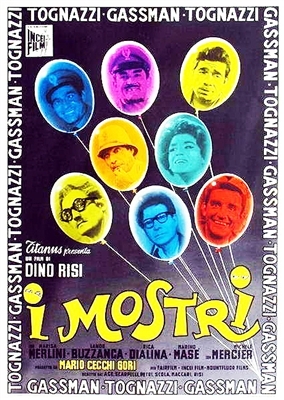 In a series of vignettes, director Dino Risi, along with Ugo Tognazzi and Vittorio Gassman, skewer Italian social mores of the early sixties, including raffic jams, a father passing on to his son the deceitful ways to survive everyday life, punch drunk ex-fighters, exploitation of a blind man, and a man who is much more interested in television than in his wife are among the many stories told here.This film was followed by a sequel in 1977 called I Nuovi Mostri. I glad to have such a varied collection. Tognazzi never falters, especially in the role of a father imparting to his young son sage, if immoral advice. I'll also treasure Gassman's 'Jim Carey-esque' physicality in a boxing ring, his crossing of a busy street, and a turn as an amorous woman. I have been looking for this Italian comedy with English subtitles for quite some time. The copy offered by Movie Detective was perfect in every way. I couldn't be more pleased! !